Looking for unique, one-of-a-kind gifts to give or to keep for your own enjoyment? Beyond Fibrefeatures woven, knitted, spun and felted items handcrafted by Guild members as well as jewellery, pottery, leather work and more made by other local artists. Try your luck with bids on our silent auction items, relax in our Tea Room with a warm beverage and enjoy the ongoing fibre arts demonstrations. Are you a fibre artist? 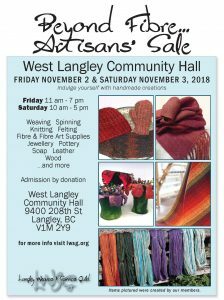 You’ll find yarn, fibre, supplies and equipment at the sale. Come visit us for our 2nd year in our convenient West Langley location on our new Friday and Saturday dates (we’re not open on Sunday). Fri. Nov 2 – 11 a.m. to 7 p.m. Sat. Nov 3 – 10 a.m. to 5 p.m.